For a city like Bengaluru, which is already struggling with its garbage on normal days, the task ahead of cleaning the roads seems humungous. The post-Diwali chaos is upon the city, as the roads are covered with firecracker debris and mounds of organic festival waste and pourakarmikas work without method or guidance. The festival of lights is here accompanied by the usual bursting of crackers. For a city like Bengaluru, which is already struggling with its garbage on normal days, the task ahead of cleaning the roads seems humungous. Seeing the many blackspots that have become an eyesore around Bengaluru, the high court recently gave the BBMP a strong dressing down and ordered it to get its act together. In response, the civic agency came out with a pat assurance to penalise those who indiscriminately dump their rubbish in the city or worse, set fire to it, letting off harmful emissions into the environment. But civic experts note that the problem is a lot more complex and cannot be fixed so easily. They point out that there is a lot wrong with the garbage collection system itself and it is the BBMP’s failure to collect the rubbish door-to-door, which is at the root of much of the problem. While the dustbins disappeared almost overnight after the new door- to- door collection of garbage was introduced, all that this has achieved is making Bengaluru filthier as the rubbish is now finding its way on to the streets. In his view, those who generate garbage in bulk should be given incentives to handle their own waste or employ certified garbage handlers to reduce the BBMP’s burden. 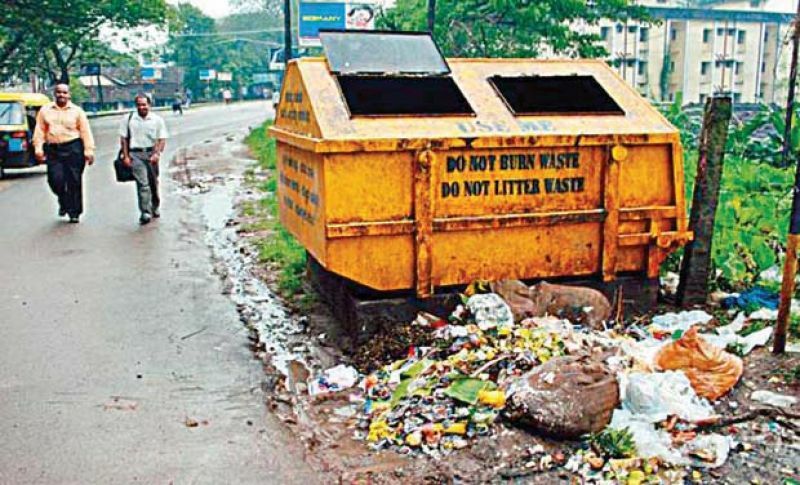 Solid waste management expert, Ram Prasad too believes that for any scheme to sustain it needs a strong foundation.“The BBMP is doing everything but stick to the fundamentals of garbage collection. If it doesn’t know what these fundamentals are, it must refer to the guidelines of Swacha Survekshan Survey 2019, which have it all. For example, based on the total number of pourakarmikas and the spread of the ward, each has to be given a specific stretch to clean. But why is the BBMP not able to do it ? Because there are not as many pourakarmikas on duty as shown in his records by the contractor,” he explains. If people are today not handing over their garbage to the pourakarmikas and are dumping it on the streets, the BBMP should find out why, he reasons. “Are people missing the cycle because they have to leave for work before the pourakarmikas arrive or are they converting their wet waste into compost and have nothing to hand over to the sweepers? If they are not at home when the garbage is collected in the mornings, they should be told to inform the pourakarmikas to collect the garbage placed on say their compound wall or staircase in their absence. And if they still persist in dumping their garbage in the open, they should be heavily fined,” he agrees. However, thrashing the idea of bringing back dustbins, Mr Ram Prasad believes no one is likely to want dustbins near their houses. “Many cities, including Srinagar, which emulated the Bengaluru model of garbage collection, have developed in a way that should shame the city,” he laments. Trash bins to make a comeback! The BBMP never seems clear on its plans for the city. For instance, not too long ago it changed its tune suddenly after calling for road widening to tackle Bengaluru’s traffic and opted for the TenderSure project with its wide pavements and narrow roads as a solution. Now it seems to be at it again. Only this time it is regarding the city’s garbage. As its door- to- door garbage collection, introduced a few years ago, totters under the weight of poor planning and contractor apathy, it seems to be veering around to the idea of once again introducing dustbins in the city that were removed to make the former scheme possible. Only this time it is regarding the city’s garbage. 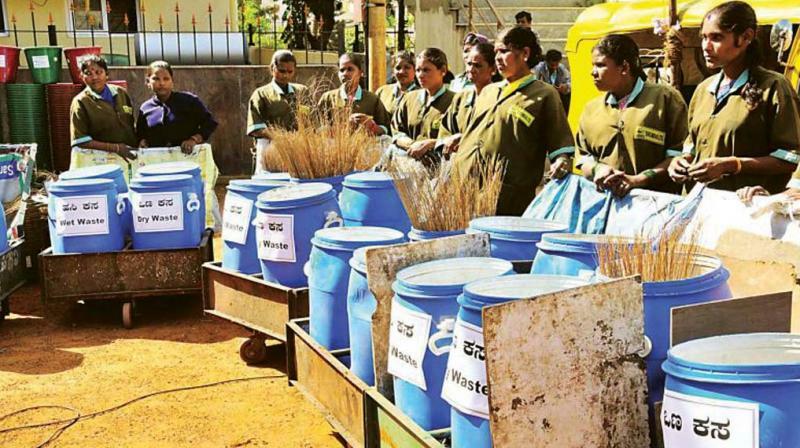 Says a BBMP official, “We have placed dustbins at many strategic locations in the city already and will introduce more of them in days to come.” The dustbins, it seems, will make a reappearance even as garbage is collected twice a day door- to- door to allow those, who miss the morning round, to hand it over in the evening. “We are considering this as we do not want to give people the option of dumping their rubbish on the streets,” the officer explains, claiming that the civic agency is doing its best to improve garbage collection. As an incentive, it also plans to waive off the solid waste management cess for those who compost their wet waste as this reduces the burden on the BBMP, he reveals. The High Court order on slapping criminal cases on litterbugs reminds me of “The Broken Windows Theory,” which has been widely credited for reducing crime in New York City in the nineties. It seems to apply to our garbage black spots too. But despite outreach campaigns, warnings, grassroots volunteer work, and rangolis, the problem never has not gone away. I think it is high time we made a serious attempt to scientifically understand behavioral and social aspects of the problem to find long term solutions. Filing criminal cases may sound like a great idea, but if you consider the implications it is unlikely to work in the long run. First, our courts are overloaded already and adding more cases will make them even slower. Second, who will enforce this and file the cases? How can those who drive by in fancy cars and throw stuff be brought to justice? Chances are those without means to defend themselves will get caught and not the big fish who already know how to work the system. It may look good for a couple of weeks, but won’t have any real impact. Rather, let’s adapt the broken windows theory to black spots and keep them sparkling clean day after day. The BBMP needs new bylaws, similar to the new advertising laws, to impose heavy fines for littering and involve local residents to enforce them strictly. It could start with one ward in each zone and make it a role model with zero tolerance for black spots. The ward committees could be made responsible to keep it clean and set an example.